August 1 (and this week) is in many places considered a special time. 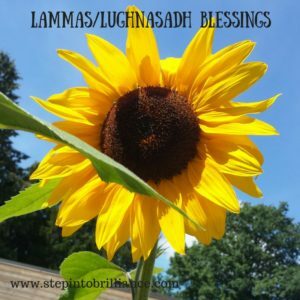 Lammas, also known as Lughnasadh (pronounced Loo-NAS-ah), falls on Monday, August 1 this year. It is a holiday based in age-old Earth-based traditions. It is a celebration of the first harvests and when we first begin to notice the lengthening of the nights – just little. I’m sure you’ve noticed lots of local produce being available right? It’s so lush and beautiful. The sunflowers growing in my local community garden are just stunning! It’s also a perfect time to take stock of what we are also harvesting in our lives. We sow seeds of intention all of the time, sometimes purposefully, sometimes randomly. What we put out into the world is exactly what we will be harvesting a little later on. I am certain you wouldn’t plant corn and expect to harvest tomatoes right? And yet…we kinda do this all the time in our lives don’t we? Consider if the seeds you’ve been sowing are bringing you what you want or not. It might be time to not only accept the harvest you have right now, but also to be more intentional about what you are planting for the future. Are you planting joy out into the world or are you planting complaints, frustration and feelings of lack? It’s hard to remember that we must wait for the seeds of joy to grow and flourish, just as we must wait on the pumpkin til the fall, even when the strawberries come and go so early in the summer. Everything has it’s time. Being patient, tending the environment, pulling the weeds – these are the same jobs, even if metaphorical, that we must do in our lives in order to reap a harvest we are excited about. Because you can only reap what you have sown, don’t you think it’s worth a few moments of contemplation? Planning? Reflection and Thought? As I mentioned, this is the perfect time for it. A really simple way to do this is to light a candle (yellows and oranges are perfect). As you burn it, give thanks for those things you have received already and those things that are still to come. Include the bounty of the earth as well as all the emotional, spiritual and personal growth you have created. Of course the physical act of getting out and gathering some of the earths gifts, with joy and gratitude and being really mindful of the work our ancestors used to do to survive is a beautiful way to honor the gifts the earth gives us. It also creates a space for you to connect with nature, connect with the gifts all around us and reflect and release. It truly is a beautiful time of year in so many ways. Isn’t it amazing how nature continues to teach us if we just take a moment, breathe and pay attention?